The scene-stealer is that detached prominence [that appears to be a cloud] off to the left. That’s the leftover material ejected from the Sun by an erupting sunspot (you can see other sunspots in the picture as well). The gas is ionized — a plasma — and so it’s affected by magnetic fields. The material follows the magnetic field of the Sun in the explosion, lifting it off the surface and into space. Sometimes it falls back, and sometimes it leaves the Sun entirely. In this case, Alan caught some of the material at what looks like the top of its trajectory. 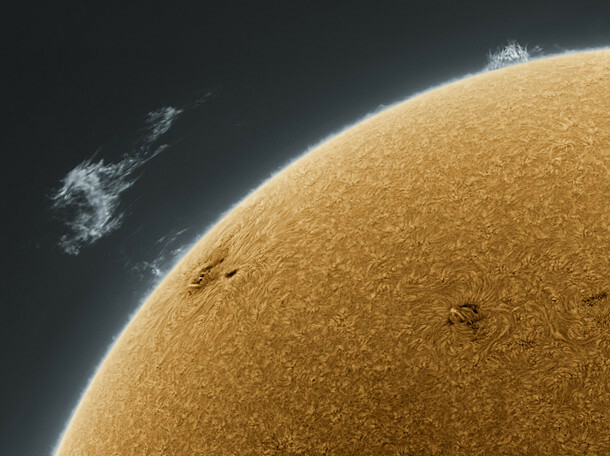 The beauty of this picture belies its violence and sheer magnitude: the mass of material in a prominence can easily top 10 billion tons! As for size, see that dark elongated sunspot near the base of the prominence, just to the right of the bigger, speckly one? That spot is roughly twice the size of the Earth. We’ve come a long way since the discovery of sun spots in 1611… but that too was the work of a gifted and dedicated amateur. 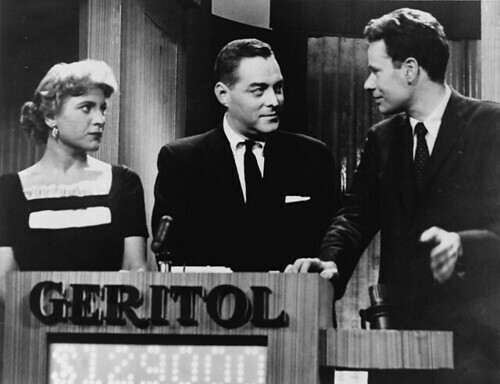 As we raise our SPFs, we might recall that on this date in 1957, a star of a different sort fell when Charles van Doren’s winning streak on the television game show Twenty One came to an end. Van Doren was a young Columbia professor at the time, the scion of a storied family: son of Pulitzer Prize-winning poet and literary critic/teacher Mark Van Doren and novelist and writer Dorothy Van Doren, and nephew of critic and Pulitzer Prize-winning biographer Carl Van Doren. This pedigree, along with an academic resume that included St. Johns, Cambridge, and Columbia and advanced degrees in both astrophysics and English, made him a natural for the broad general knowledge challenge of the quiz show. And indeed, in January of 1957, Van Doren started a winning run that ultimately earned him more than $129,000 (more than $1 million in 2009 dollars) and made him famous (he graced the the cover of Time on February 11, 1957). His reign ended when he lost to Vivienne Nearing (a lawyer whose husband Van Doren had previously beaten). I was involved, deeply involved, in a deception… I asked (co-producer Albert Freedman) to let me go on (Twenty One) honestly, without receiving help. He said that was impossible. He told me that I would not have a chance to defeat Stempel [the long-running champ before Van Doren knocked him off] because he was too knowledgeable. He also told me that the show was merely entertainment and that giving help to quiz contests was a common practice and merely a part of show business. This of course was not true, but perhaps I wanted to believe him. He also stressed the fact that by appearing on a nationally televised program I would be doing a great service to the intellectual life, to teachers and to education in general, by increasing public respect for the work of the mind through my performances. In fact, I think I have done a disservice to all of them. I deeply regret this, since I believe nothing is of more vital importance to our civilization than education.